I find body lotion boring. Boring to apply, boring whilst waiting for it to dry, with not enough return benefits. I never really saw any difference, even after slapping on handfuls of the stuff. I thought the concept of body lotion was certainly something my life could do without. That was however, until my friend bought me this as a birthday present. Oh it is good. But I know, £18 for a body lotion is many pennies. But I say again, it is good. So good, that I would look forward to putting it on. It doesn't leave you with that feeling of having a layer on your skin after you've applied it (I hate that feeling) and sinks in straight away - no waiting around. It is quite runny I suppose, and I like this texture, but don't let it mislead you into thinking runny = not moisturising enough. Think again. I am a bit funny about lotions and potions having strong smells, but this lotion has a very delicate, light smell, that is just lovely. ﻿I even caught myself a couple of times staring at my just-moisturised arm in quiet admiration - then I got over myself. 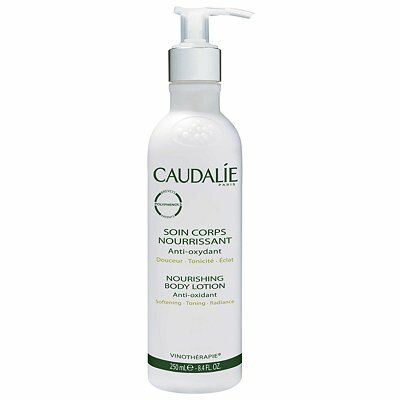 Caudalie is a French company, which uses the waste products left over from the wine-making process in its products. The left-over grape skins are packed full of anti-oxidants which as we all know, are ever so good for your skin. Polyphenols are extracted from the grape-seed and these prevent premature ageing of the skin, and gingko biloba activates microcirculation. As they say on their website, "protected and revitalized, your skin is firmer and more luminous for all day moisture" - yes, luminous! It was this quality which had me so entranced, during my arm-staring session. So, this is definitely going on my Christmas list. (And if you know of another body lotion with the same marvellous qualities as this one, but that doesn't cost quite so much, let me know and I'll love you forever). p.s. just found it on the Feel Unique website for £15.30 with free delivery, which is at least a little bit cheaper.